The road to World Cup glory became that much more difficult this morning for the Americans as FIFA held the Final Draw to determine the groupings. USA was placed in the so-called 'Group of Death,' along with major powerhouses Portugal, Ghana and Germany. Officially, it is Group G.
Not only are the other teams in the group ranked high, they have the Americans' number. Germany eliminated the US in 2002. Ghana knocked the Americans out the last two World Cups in 2006 and 2010. At least the Americans have a winning record against Portugal since 1990 at 3-1. 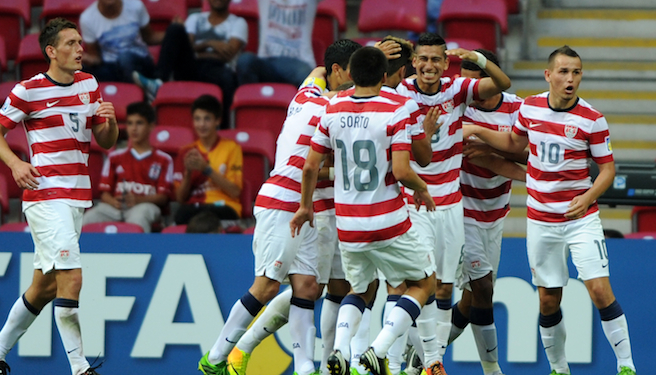 Versus all three teams, the US is 4-8 since 2000. Adding to the American woes, is the longest road schedule of any team in the tournament at 9,000 miles. In addition, they will have to play in the Amazonian town of Manaus, which was the only thing coach Jurgen Klinsmann wanted to avoid. Before the draw, Klinsmann, in a famous last words sort of way, said he feared playing in Manaus more than facing any opponent. The city is the furthest distance and features a stadium that required an Amazon tributary to be drained. This will mean soaring heat and humidity that reportedly can melt the stadium pain. Per ESPN’s sport performance index (SPI), the Americans have only a 9.5 percent chance of winning the group, a 30 percent chance of advancing, and a 60 percent chance of being sent home early. Group A – rival Mexico, seems to get a safer journey with Brazil, Cameroon, and Croatia. Group B – another contender for the Group of Death tag reigning champions Spain, Chile, Netherlands, and lowly Australia. Group C – features Columbia, Ivory Coast, Japan and Greece. Group D – matches locals Uruguay and Costa Rica matching up England and Italy. Group E – top team France gets the easiest route to redemption with opponents Ecuador, Switzerland, and Honduras. Group F – super underdog Iran gets a chance to do the impossible in an easier group with Argentina, Bosnia-Herzegovina, and Nigeria. Group H – Quite possibly the most exciting group on paper (though none are fan favorites) with an evenly matched up Russia, Belgium, Algeria, and South Korea. If there is a bright spot to the drawing, is that the US will face an easier opponent in Group H.
World Cup action will start June 12 with Croatia and Brazil in Sao Paulo. Brian Reddoch is a CraveOnline reporter and rabid fan of all teams Seattle. You can follow him on Twitter @ReddReddoch or “like” CraveOnline Sports on Facebook.